In describing auroras as he saw them in the far north in 1908, poet Robert Service captured the sense of fluid motion, the vivid color, and the fiery, flame-like qualities one sees from the ground. His description works just as well in the southern hemisphere and when looking down from above. 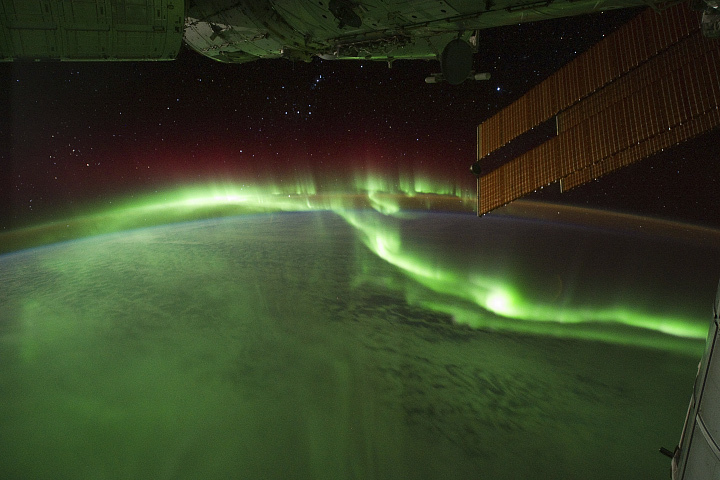 Astronauts on the International Space Station (ISS) used a digital camera to capture several hundred photographs of the aurora australis, or “southern lights,” while passing over the Indian Ocean on September 17, 2011. If you click on the movie linked above, you can see the flowing ribbons and rays below as the ISS passed from south of Madagascar to just north of Australia between 17:22 and 17:45 Universal Time. Solar panels and other sections of the ISS fill some of the upper right side of the photograph. Auroras are a spectacular sign that our planet is electrically and magnetically connected to the Sun. These light shows are provoked by energy from the Sun and fueled by electrically charged particles trapped in Earth’s magnetic field, or magnetosphere. 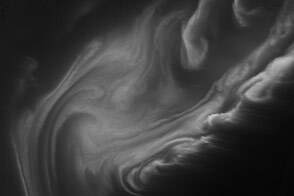 In this case, the space around Earth was stirred up by an explosion of hot, ionized gas from the Sun—a coronal mass ejection—that left the Sun on September 14, 2011. The pressure and magnetic energy of the solar plasma stretches and twists the magnetic field of Earth like rubber bands, particularly in the tail on the night side. This energizes the particles trapped in our magnetic field; that energy is released suddenly as the field lines snap the particles down the field lines toward the north and south magnetic poles. Fast-moving electrons collide with Earth’s upper atmosphere, transferring their energy to oxygen and nitrogen molecules and making them chemically “excited.” As the gases return to their normal state, they emit photons, small bursts of energy in the form of light. The color of light reflects the type of molecules releasing it; oxygen molecules and atoms tend to glow green, white or red, while nitrogen tends to be blue or purple. This ghostly light originates at altitudes of 100 to 400 kilometers (60 to 250 miles). In the second image above, and in the last frames of the movie, light from the ground replaces the light show in the sky. 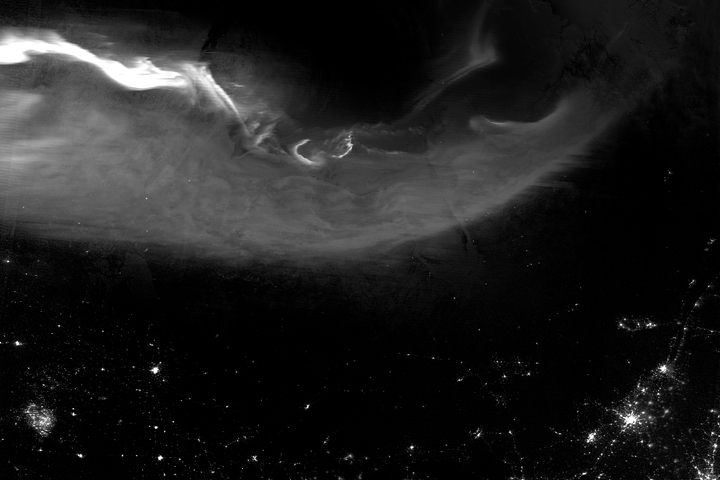 Wildfires and perhaps some intentionally set agricultural fires burn on the continent of Australia, with smoke plumes faintly visible in the night sky. A gold and green halo of atmospheric airglow hangs above the horizon in the distance. For more movie views of the Earth from above, visit: ISS Crew Earth Observations Videos. Astronaut photographs ISS029-E-06020 and ISS029-E-06244 were acquired on September 17, 2011, with a Nikon D3S digital camera using a 24 mm lens, and is provided by the ISS Crew Earth Observations experiment and Image Science & Analysis Laboratory, Johnson Space Center. 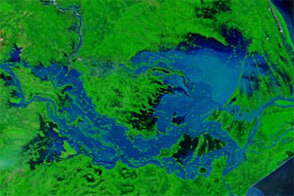 The images were taken by the Expedition 29 crew. 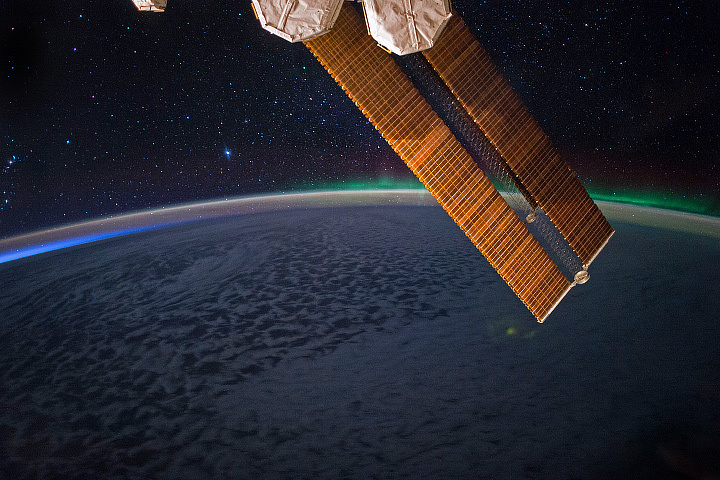 The International Space Station Program supports the laboratory as part of the ISS National Lab to help astronauts take pictures of Earth that will be of the greatest value to scientists and the public, and to make those images freely available on the Internet. 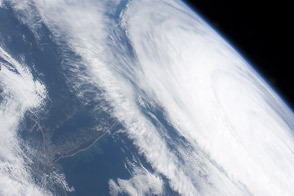 Additional images taken by astronauts and cosmonauts can be viewed at the NASA/JSC Gateway to Astronaut Photography of Earth. Movie by Robert Simmon. Caption by Michael Carlowicz. 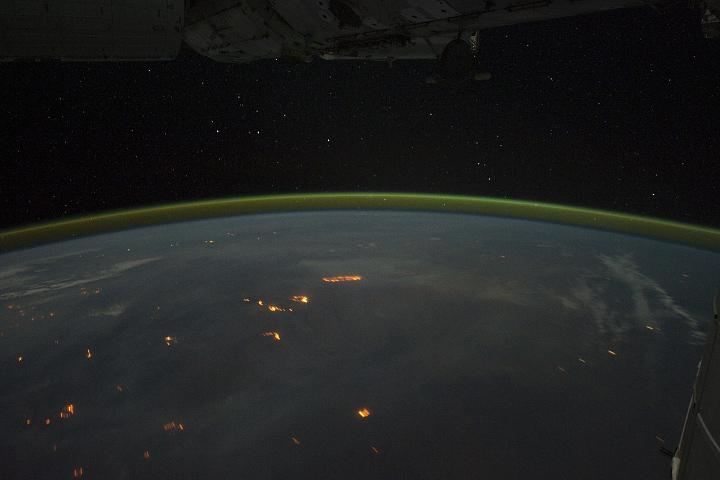 Astronauts on the International Space Station captured these views of the aurora australis ("southern lights") and wildfires in Australia in mid-September 2011. Carlowicz, M.J. and Hill, S. (2002) NASA Poster: Aurora—Fabled Glowing Lights of the Sun-Earth Connection. Accessed September 26, 2011.